Hey Can We Also Get 9 More Episodes of “Carnivale”?!! Hey anything is possible these days in the way of TV and movies now that we have fans demanding what they want to see via social media, blogs ect. It’s been proven that us fans aren’t as dense as Hollywood would like to believe we are, we enjoy intelligent well crafted television show and movies dammit-we really do! The announcement of David Lynch’s new upcoming season of Twin Peaks is proof of fans interest in shows that may have, at one point, been too bizarre for television at the time. So recently I’ve decided to watch “Carnivale” again, which is one of my favorite HBO shows of all time! Unfortunately this show only got two seasons despite being nominated and winning five Emmy awards, the show was deemed too inaccessible for the average viewer. This is one of the reasons the show was so great, it clearly didn’t fit the mold of the average television show. I believe if the show was broadcast today (it originally aired in 2003) it would have much stronger audience. The show’s complex story and rich history never was given enough of a chance to unfold onscreen, the cast had barely a traditional pretty Hollywood face anywhere in sight. The show was dark, epic, gritty, extremely creepy, exploring the darker sides of religion good and evil. It’s sets and styling were perfect period, every episode was eye candy. It at the time had quite a high cost of 2 million per episode and a large ensemble cast. The show ended far too soon and for years fans have attempted to get petitions going to get it back on air with no luck. However as I watch these two seasons again in 2014 they actually feel like they were made now and not over ten years ago. I’m not sure how the show might pick up this many years later, but I’d certainly love to catch what might be the case with Ben Hawkins, Samson and the crew. It’d be a great reason for Nick Stahl to clean up his act. This a show that has many questions left, and it’s plot, symbolism and themes to this day still have people debating. So let’s continue the journey with this traveling Carnivale, I guarantee it’s a far more compelling trip than American Horror Story “Freak Show” could ever be!!! 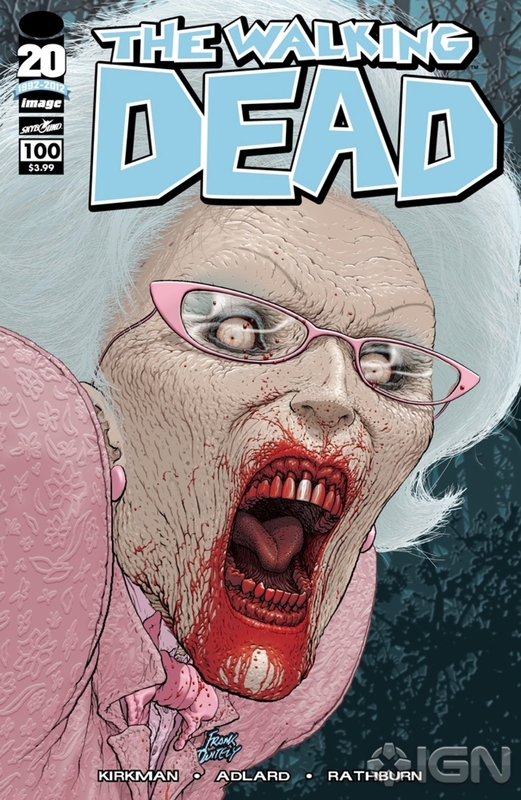 The Walking Dead #100 Predictions! 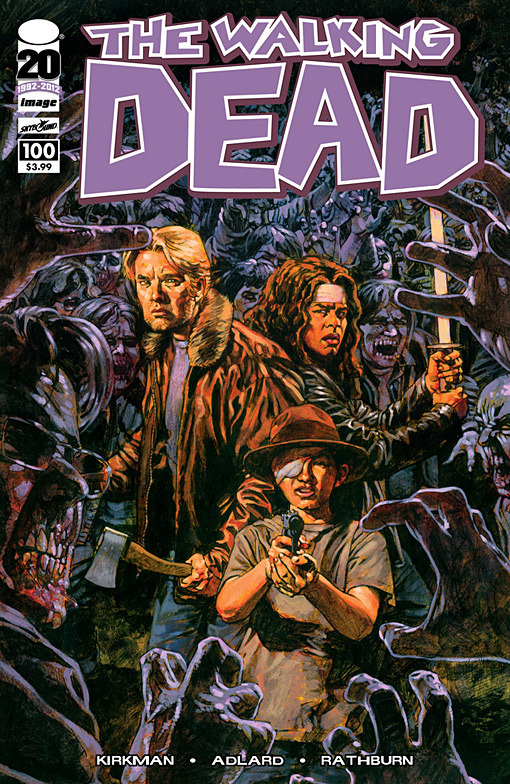 Wow I can’t believe we’re almost one hundred issues into The Walking Dead! Still one of my most anticipated comic books every month. Kirkman never thought it would become the sensation it is today. So now obviously this has gotten us all wondering what the hell is going to go down in the big issue? What could possibly top some of the last surprises we’ve endured? Carl getting shot, Tyreses’ death, the Governor being “killed” by Michonne, Lori and the baby’s death and most recently Abraham’s death were hands down some of the most intense and emotional deaths in comic book history. But is issue #100 going to be purely witnessing, once again, deaths of our current roster of Rick’s minions? Only time will tell, however here are a couple things I think would be a big surprise for this milestone issue. First let’s think about what Kirkman could possibly do to blow our minds. I have felt for quite sometime that perhaps Lori and / or their baby may not actually really be dead! 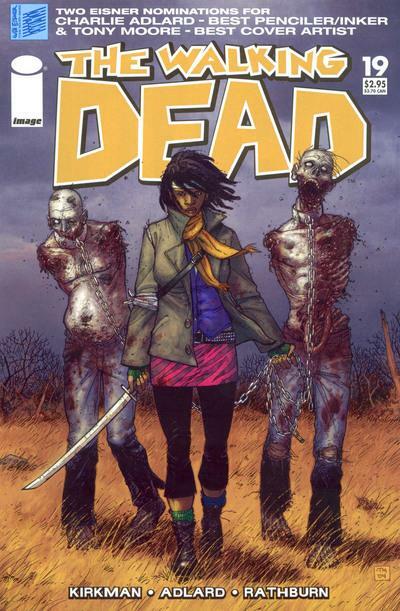 My guess is that sometime soon, perhaps even in this next issue Lori could be revealed to still indeed be alive. We really only saw her get shot, it was never confirmed by anyone that she was truly dead. 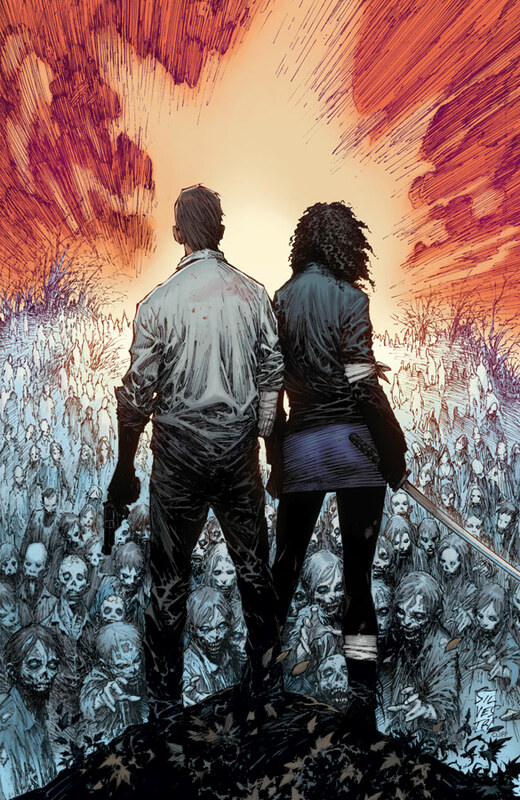 My guess is this would be a major move Kirkman has at the very least considered. Would this shock you? Second would of course be the big one. Rick biting the dust! I am certain this won’t happen soon but I am certain it will happen and perhaps Carl will lead the team or grow into a leader. However imagine if Rick was bit and the disease took. This alone would pack a powerful punch, the issues that follow showing the remaining members of his group watching him slowly descend into becoming the walking dead. Imagine Carl and say Michonne heading out into the world on their own. This, when it happens is will be a powerful end or new beginning to the book. I guess anything could really happen, however I highly doubt Michonne has anything to worry about as she just made her wildly popular tv appearance. Personally as much as I love the title I’d love to see it move into a different direction. I have been a little bored with this whole “setting up a community” thing for quite a while now. I would love to see them on the road again, it’s so much more exciting and I think more believable. I mean how many times are we going to see the gang meet up with psychotic people and get into an altercation? It’s all been good and fine up til now but i think we need to get a little more adventure back into the title. Listen up Kirkman, I think a logical choice of action would be perhaps them trying to get to an island somewhere and finding a boat? Get to some water. I know that’s been an idea in movies already but so was your whole opening to the story which was basically a blatant rip from 28 Days Later. Expanding on that concept would be very intriguing. I think searching for a small plane or meeting a pilot would be a great exciting new direction for the crew. It seems a little strange to me that the characters seem content with giving up and just accepting making a community somewhere. They need someone who’s looking for solutions and bigger answers to the problem other than Rick’s flawed one dimensional thinking about restarting civilization at some purely random location without knowing what the hell is really going on. Doesn’t anyone wonder what the big picture is?! I also am NOT a fan of Kirkman stating there will never be explanation for the undead. I feel not exploring that idea is uninspired. What if there was a mutation? What if there was more than just zombies out there to fear? The book needs something new and exciting to happen in it or we’ll get the same scenarios happening over and over. Yeah we all get it, the living people are more scary than the zombies, how about letting that idea rest for a bit and get back into the monsters being more threatening? It’s time to introduce some new ideas into this book while still keeping with the tone so far. So I hope for something great to down in issue #100 and not just an issue where more supporting characters die off. What about you?